You have a choice to install with or without US Holidays; add and edit your own at any time! 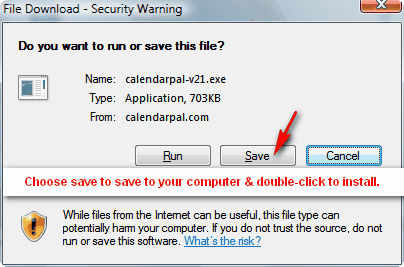 You may install CalendarPal in one of two ways: You may install from the web, or download the installer and save it to your desktop and then double-click it to install. Installation is easy.. the setup wizard will guide you. 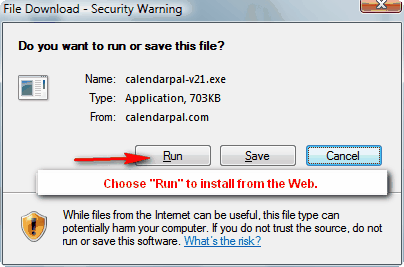 Option #1 - Install From Web: Install CalendarPal directly from the Web without saving it to your desktop. Just choose "Open" or "Run" when the download dialog appears (See figure 1 below). CalendarPal will download and open with the installation wizard. When the download dialog appears choose "Save" (see figure 2 below). Now locate the saved file on your desktop, double-click it to install. Installation is easy.. the setup wizard will guide you.